Weslock door levers are available in several styles and finishes. Just choose a lever style below and see finish options on the following page. Weslock lever handles can be keyed alike and most ship right away unless noted. Why Buy Weslock Lever Handles? If Security, Safety, and style are important to you, then Weslock is your choice for quality hardware for your home. The construction and design of Weslock knobs levers and entry handles exceed ANSI Grade 2 ratings. Not only are they strong and long lasting, but Weslock hardware is well built for years of use in the home. Split Spindles and Easy Action Latches set Weslock apart from the competition and contribute to trouble free operation. - Heavy duty adjustable backset strike for 2-3/8" and 2-3/4" backset with square and rounded corner faceplate options. - Lever Handles and mounting screws. - Keyed locks and Privacy will include Keys or unlocking tools, single dummy levers are surface mount and do not include latches and strikes. Weslock doorknobs, lever handles, and handlesets are made of various high quality materials: solid molten bronze, solid brass and die cast zinc depending on the series you choose. Great warranty coverage also varies by series. Deadbolts include 1" throw and hardened steel rollers to prevent sawing. Weslock knobs are built well to last through years of use. Weslock lever handles are available in several functions the most common being keyed entry, privacy (bed and bath), passage (hall and closet) and single dummy. Each function is used for little different application. Weslock keyed entry lever handles use a 5-pin keyway and meet ANSI A 156.2 grade II lock standards. Keyed entry levers have a push button on the interior rosette to lock and unlock the door. One turn of the interior lever unlocks and opens the door. Unlock from the outside using a key. The lever handle is only locked when the push button is in the locked position. Weslock privacy locksets work just like the keyed entry levers, but you do not need a key to unlock from the outside. There is no key cylinder, but there is a pinhole through which you can unlock the door using the generic tool provided. Privacy locks are generally used on bedroom or bathroom doors. Weslock passage doorknobs are non- locking. These are great for hall doors or closet doors that do not need to lock, but a latching mechanism is still required. 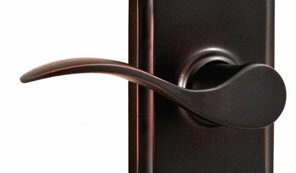 Weslock dummy lever handles are sold individually as a single dummy. These are non-functioning levers that are mounted to the surface of the door. 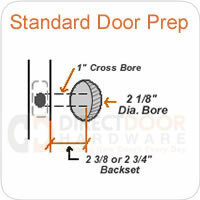 These are used on doors that do not need a latch mechanism like the inactive side of a french door for example.